Violent, tense, and above all absorbing, ‘Sicario’ finds French-Canadian director Dennis Villeneuve at the height of his prowess. 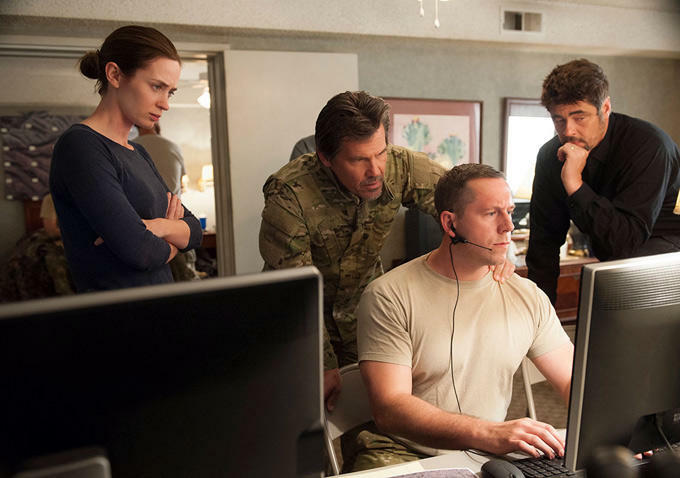 Led by an emotional and honest performance from Emily Blunt and especially magnetic, ruthless work from Benicio Del Toro; this action juggernaut is a must-see, even if its unflinching visuals may be difficult for some to swallow. Relentless from start to finish, a somber, looming tone cloaks Dennis Villeneuve’s thriller in risk and secrecy. Aided by Roger Deakins ghostly, majestic cinematography and Jóhann Jóhannsson’s penetrating, ominous, intimidating score. ‘Sicario’ is an exhausting, inescapable experience. Taylor Sheridan’s horrifying, entertaining, narratively-complex story and devastating, memorable dialogue effortlessly elevates the intensity and execution in Blunt, Del Toro, and Brolin’s performances. Additionally allowing Villeneuve and Deakins to truly explore and excel behind the camera. ‘Sicario’ has Roger Deakins in award-season form and features some of the master cinematographer’s finest work. Most notably, a night-vision sequence that gets the heart racing and palms sweating. The delicacy and boldness in Blunt’s performance cannot be understated. Imperative and determined, Blunt’s Macer mimics the viewer’s terrified, meddlesome mindset, expertly holding their attention as if you sit fastened in the interrogation chair. Outshining his co-stars’ already blinding brilliance, Benicio Del Toro’s ferocious, smothering, calculated anti-hero is a performance to contemplate and savour. 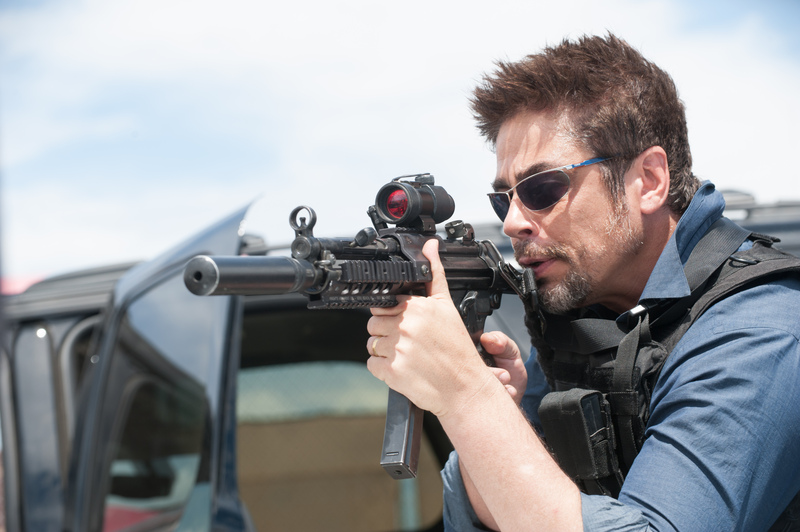 Exercising the actor’s formidable charisma, ‘Sicario’ catapults Del Toro back into the working elite. Uncompromising, thought-provoking, and brutally straightforward, ‘Sicario’ is unmissable. Sicario: 9.5 out of 10. Posted on September 27, 2015, in Action and tagged Action, Benicio Del Toro, Blunt, Brolin, Deakins, Drama, Taylor Sheridan, Thriller, Villeneuve. Bookmark the permalink. 17 Comments. Nice review. I’ve only heard good things about this film! Can’t wait to catch it. Thanks Cindy! The good things you’ve heard do not surprise me in the slightest. A near-perfect piece of cinema. I trust your opinion, Joseph. Thank you, truly means a lot Cindy :). Damn right!! Absolutely tremendous film! What I’ll worry now about it is that viewers might forget about it during awards season since it didn’t exactly come out toward the end of the year. I know! I’m pulling for Del Toro to earn at least a nomination, he’s bloody brilliant! Also, Deakins cinematography might be his best to date. Couldn’t agree with you more. I very rarely give a film a perfect score, almost did so with this one. Regardless, It’s flawless in my heart haha. Really hoping Del Toro grabs an Oscar nomination for his performance and Deakins for his wondrous cinematography. Del Toro would certainly be deserving. He was f**king fantastic. Yeah, he’s like, encroaching on that guy’s family seated at dinner and I swear to god I haven’t been that uncomfortable since Clarise was being stalked in the darkness in Silence of the Lambs. Great, great stuff. Another glowing review of this movie. Let me at it!! Oh my, I cannot stress how phenomenal this film is. You’ll love it! Looking forward to reading your thoughts.